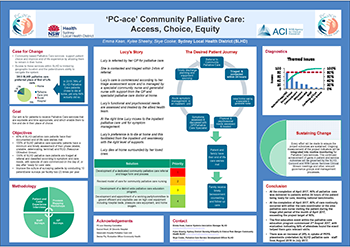 This project developed a palliative care referral and triage process and education program in Sydney Local Health District (SLHD), with a focus on services delivered in the community. To standardise palliative care in SLHD and ensure equitable access to services in the community. Increases the quality of palliative care across health services in the community. Embeds clinical assessment tools into routine practice. Ensures care is customised to the preferences and circumstances of the dying person. Translates clinical evidence and strategic directions into practice. Enhances staff satisfaction and retention. Reduces length of stay in acute care settings. Allows palliative care staff to develop specialist clinical skills. Improves patient and carer satisfaction and streamlines their healthcare journey. The number of deaths in Australia is predicted to increase from 143,900 per year in 2011 to more than 320,000 in 2056. Health expenditure is also expected to increase 12-fold for those over 85 by 2050. As a result, demand for palliative care services has increased across Australia, with a 15 per cent increase in SLHD inpatient palliative care consultations in 2015-16 from the previous year. Community-based palliative care services can improve the end of life experience, by supporting the patient’s choice and allowing them to remain in their home for as long as possible. However, prior to the project these services were limited in SLHD and were often only available to patients with certain prognoses. In addition, access to palliative care services in SLHD was often dependent on geographic location and the patient or carer’s ability to navigate the system. These factors made it difficult to provide high-quality palliative care in community, inpatient and dedicated palliative care units. While extensive palliative care strategic plans and service delivery guidelines were available to support service development in SLHD, consistent translation into local policies, procedures and practices was challenging given the complex range of service providers, clinical settings and patient cohorts involved. A palliative care nursing referral and triage process was established, which ensures that patients are contacted and triaged within 24 hours of referral. A dedicated community palliative care referral and triage form and process was developed, to initiate the episode of care on the day of or after the patient is ready for care. A staff palliative care education program was developed, to encourage clinical rotations through various palliative care settings and allow staff to attend palliative care education sessions. The program is based on the Program of Experience in the Palliative Approach (PEPA), which enhances the capacity of health professionals in the area of palliative care, through clinical placements in specialist palliative care services or interactive workshops. A review of the model of care for community palliative care services is underway, with recommendations to be agreed on and implemented across SLHD once complete. A committee will be appointed to govern efficient and equitable use of high-cost palliative care equipment, including hospital beds, pressure care equipment and home oxygen. Palliative Care Home Support Packages (PEACH) - A partnership between South Western Sydney Local Health District and non-government organisation Silver Chain, which works in conjunction with five local health districts in NSW to provide additional support for palliative care patients, so they can die at home. By end April 2017, 90 per cent of palliative care was delivered to patients within 24 hours of the patient being ready for care, meeting national Palliative Care Outcomes Collaboration benchmarks. By end April 2017, 80 per cent of patients had a care coordinator or area palliative care nurse visit them during that month, exceeding the project target of 50 per cent. There was an increase of 25 per cent in uptake of PEPA placements undertaken by SLHD palliative care staff from August 2016 to July 2017. Bringing medical, nursing and allied health services together to discuss diagnostics and solutions is valuable and can improve collaboration and outcomes. Communicating updates to staff at every stage of the project is paramount for success. The scope of the project was broad and can be refined for future projects, such as a specific focus within palliative care. Bowden G, Bliss J. Does using a hospital bed have an impact on the meaning of home? British Journal of Community Nursing 2008;13(12):556, 558-562. Newton J, McVicar A. Evaluation of the currency of the Davies and Oberle (1990) model of supportive care in specialist and specialised palliative care settings in England. Journal of Clinical Nursing 2014;23(11-12):1662-1676. Philip JA, Le BH, Whittall D et al. The development and evaluation of an inpatient palliative care admission triage tool. Journal of Palliative Medicine 2010;13(8):965-972. Spencer L. Hospice to home: a patient-centric multiprofessional community approach. International Journal of Palliative Nursing 2015;21(5):245-250.